The formation of crystalline substances from solutions or melts. the formation of crystals from vapors, solutions, melts, or solids (amorphous or crystalline), upon electrolysis, or in chemical reaction. Crystallization leads to the formation of minerals. The crystallization of water plays an important role in atmospheric and soil phenomena. Crystallization is the basis of metallurgy and the production of semiconducting, optical, and piezoelectric materials, films for microelectronics, and metallic coatings. It is used widely in the chemical, food, and medical industries (purification and the production of fertilizers, salt, sugar, chemicals, and pharmaceuticals). Conditions. If a crystal does not melt, dissolve, evaporate, or grow, then it is in thermodynamic equilibrium with the mother medium (the melt, solution, or vapor). Equilibrium of a crystal with a melt of the same material is possible only at the melting point Tm, whereas equilibrium with solution or vapor is possible only when the latter are saturated. A supersaturated or supercooled medium is a prerequisite for the growth of crystals immersed in it, and the rate of crystal growth is proportional to the deviation from equilibrium. Crystallization is the phase transition of matter from the state of a supercooled or supersaturated mother medium to a crystalline state with lower energy. Excess energy is evolved during crystallization in the form of the latent heat of crystallization. Some of this heat may be converted into mechanical energy; for example, a growing crystal may lift a weight placed upon it by exerting a crystallization pressure on the order of several dozen kilograms-force per sq cm. The crystals of salts that form in the pores of concrete piers immersed in seawater may lead to the destruction of the concrete. The evolution of the latent heat of crystallization heats the melt, decreases the supercooling, and retards crystallization. Crystallization ceases with the exhaustion of the substance or with the attainment of equilibrium temperature, concentration, and pressure. Crystallization nuclei. A supercooled medium may remain in a metastable state for a long time without crystallizing. For example, small drops of highly purified metals (diameter, 0.1 mm) may be supercooled to a temperature of ∼0.8 Tm. However, upon reaching a certain limiting supercooling value (critical for the given conditions in the liquid or vapor) there is an almost instantaneous generation of numerous small crystal particles, or nuclei. Spontaneous crystallization occurs. The resulting crystallites grow and, since the supercooling diminishes, new nuclei are as a rule no longer produced. Critical supercooling depends on the temperature, concentration, and composition of the medium, on the volume of the medium, on the presence of foreign particles (for example, dust particles and crystallites of other materials, on which nuclei form), on the material of construction and the condition of the walls of the vessel, on the intensity of mixing, and on the effect of radiation and ultrasound. The atoms or molecules of the crystallizing material combine into crystalline aggregates during nucleation. This process decreases the free energy of the system, but the formation of new surfaces increases it. The smaller the aggregate, the greater is the number of its particles at the surface and the greater is the role of the surface energy. With increasing aggregate size r, therefore, the work A required for its formation at first increases and then decreases (see Figure 1). The aggregate for which the work of formation is maximal is called the critical nucleus (rcr). The lower the work of formation of a nucleus, the more probable is its appearance; this accounts for the predominant nucleation on foreign particles (particularly charged particles), on the surfaces of solids, and on defects. This is called heterogeneous generation. In nucleation at the surface of a solid, nucleation takes place predominantly at surface inhomogeneities. The crystallites “decorate” the defects and inhomogeneities. Homogeneous nucleation in a pure liquid is possible only after very intense supercooling. Lowering the temperature and increasing the supercooling decrease the work of formation of the nucleus, but at the same time the viscosity of the liquid increases, diminishing the frequency of addition of new particles to the crystalline aggregates. 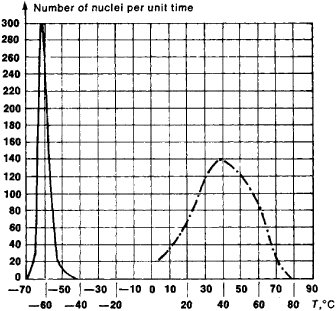 For this reason, the dependence of the rate of nucleation on the temperature has a maximum (see Figure 2). At low temperatures, the mobility of the particies in the liquid is so low that the melt solidifies while remaining amorphous, forming a glass. Large, perfect monocrystals are often grown in metastable solutions and melts by introducing small seed crystals to the medium and avoiding spontaneous nucleation. Conversely, a maximum number of nuclei is desired for metallurgical processes. Epitaxy. Crystals arising at the surfaces of other crystals orient themselves in a regular pattern relative to the latter. For example, the crystallization of gold from an atomic beam at the surface of a sodium chloride crystal yields gold crystallites whose cubic or octahedral faces are oriented parallel to the face of the sodium chloride crystal. The phenomenon of oriented growth is called epitaxy. heavily on the purity of the substrate, on the number and nature of its defects, and on the composition of the surrounding medium. It also depends on the preliminary irradiation of the substrate with electrons or X rays. The substrate orients the crystallites even through thin films (∼ 1000 Å) of carbon, polyvinyl chloride, zinc oxide, and selenium (if these are not applied in ultrahigh vacuum). Epitaxy is used in the production of monocrystalline films, which are used particularly in microelectronics. Separate, identically oriented crystallites form on the surface of a monocrystalline substrate and coalesce into a continuous film. The purity of the substrate and the absence of imperfections in it strongly influence the quality and structure of the film. Film defects arise on impurities and at the sites of coalescence of separate crystallites. Crystal growth. Crystals grow in the form of polyhedra from weakly supercooled vapors, solutions, and, less often, melts. Their most developed faces usually have simple crystallographic (Miller) indexes (for example, the cubic and octahedral faces in the case of diamond). As a rule, the relative orientation of the crystal faces is such that the greater its size, the lower its rate of growth. Since the growth rate increases with supercooling differently for different crystal faces, the habit of the crystal also varies with changes in supercooling. observed directly with the optical or electron microscope. During crystal growth, the small steps move faster than the tall steps, overtaking the latter and coalescing with them. The tall steps, in turn, split up into smaller steps. Surface step structure is heavily dependent on the conditions of growth (temperature, supersaturation, composition of the medium) and affects the degree of perfection of the crystal form. For example, the appearance of tall steps on saccharose crystals leads to the entrapment of droplets of the mother liquor and to the consequent cracking of the crystals. If the crystal contains a screw dislocation, its atomic layers resemble the levels of a garage with a spiral ramp in the middle. The build-up of such a crystal takes place by the addition of atoms to the face of the last step (see Figure 3,a). This results in the growth of the crystal layer by continuously winding up on itself and building upon the dislocation. The step assumes the form of a helix during the course of growth (Figure 3,b). At low supercooling levels, dislocation leads to the quadratic dependence of the growth rate of the crystal face on supercooling (supersaturation)—that is, the growth rate becomes appreciable even for small deviations from equilibrium. In the-case of dislocationless crystals, the deposit of each new layer must be preceded by the nucleation of the layer. New layers are generated at low supersaturation levels only in the vicinity of surface defects, but on perfect crystals and when deviations from equilibrium are large the generation of new levels at any point on the surface is also possible. In cases of large deviations from equilibrium, both nucleation and dislocation mechanisms lead to high step densities. The rate of growth increases linearly with supercooling. Steps that radiate along the face from pin pricks, scratches, and, in cases of high supersaturation levels, crystal apexes, form growth peaks. The surface of a growing face is entirely covered by these peaks. The slopes of the peaks (from face to corner) are on the order of several degrees (smaller for lower levels of supersaturation). Crystals grown from melts (for example, most metals) are frequently rounded rather than faceted. The rounded surfaces do not grow by layers, that is, tangentially, but normally, so that the addition of new particles may occur at practically any point on the crystal surface. Crystal surfaces that grow layer by layer are atomically smooth: most of the possible atomic sites in the layer are occupied (see Figure 4). Surfaces that grow normally are rough on an atomic scale: the number of vacancies and atoms adsorbed at the surface and occupying sites that should be occupied in the subsequent layer is commensurate with the total number of possible atomic sites (see Figure 5). Atomically rough surfaces and often the faces of the steps of atomically smooth surfaces contain numerous kinks. At kinks, atoms may enter the crystalline phase singly, without combining into aggregates and therefore without surmounting the potential barriers associated with aggregation. The growth of rough surfaces and steps, therefore, occurs mainly by the addition of separate particles to the kinks. 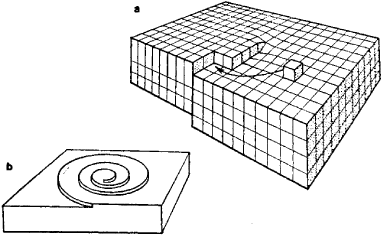 The results are that the rates of growth of rough surfaces are almost identical in all directions and that the form of the growing crystal is rounded (whereas atomically smooth surfaces grow layer by layer). The filling of each new atomic site in the crystal does not take place at once. Rather, it occurs after numerous “trials and errors” consisting of the addition and removal of atoms or molecules. The smaller the deviation from equilibrium, the larger is the typical number of attempts for every irreversible addition. The probability of the appearance of defects during crystallization decreases as the number of attempts increases, that is, as supersaturation decreases. The particles of the crystallizing substance move from the solution to the kinks by diffusion; in layered growth from the vapor phase, they also diffuse from the adsorption layer along the surface. The rate of crystal growth from solutions is determined by the ease with which the structural particle is abstracted from the molecules or ions of the solvent and added to the kinks. The rate of growth from melts is determined by the ease with which the relative positions of neighboring particles of liquid can be changed, that is, by the liquid’s viscosity. Forms of growth. The simplest form of crystal growth is polyhedral, in which case the dimensions of the faces depend heavily on the conditions of growth. The result is that crystals take lamellar, acicular, and other forms. In the growth of large polyhedral crystals from immobile solutions, supersaturation is greater at the apexes and edges of the crystals and lower near the central areas of the faces. For this reason, the apexes become the principal origins for growth layers. When the supersaturation level over the central areas of the faces is sufficiently low, the face loses its capacity for growth and the apexes overtake it. The result is the generation of skeletal forms. For this reason, perfect crystals are grown from well-mixed solutions and melts. Impurities in the mother medium are incorporated into the composition of the crystal. The ratio of the impurity concentration in the crystal to that in the medium is called the distribution coefficient of the impurity. The incorporation of the impurity depends on the growth rate. Different faces incorporate different amounts of impurities. For this reason, the crystal seems to be built up of pyramids whose bases form the crystal faces and whose apexes converge toward the center of the crystal. This sort of sectorial incorporation of impurities is brought about by the different structures of the different faces. If the crystal incorporates an impurity poorly, its excess will collect before the growth front and increase. A boundary layer (from which crystallization takes place) that is enriched in the impurity does not have time to change composition. This gives rise to a zonal structure. An analogous situation arises when a crystal is enriched in the impurity and the boundary layer is impoverished. When crystal growth is of sufficiently large volume (dozens or hundreds of cu cm and more) there occurs a spontaneous mixing of solutions and melts. In the case of a solution, the liquid layer in the vicinity of rapidly growing faces becomes impoverished in the substance and its density decreases. 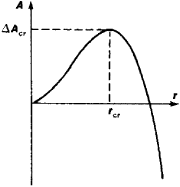 This leads to a displacement of the substance upward, called a concentration flow. Washing past the various faces in various ways, concentration flows change the growth rates of the faces and the habit of the crystal. In a melt, the heating of the liquid adjacent to the growing crystal by the latent heat of crystallization leads to convection currents. The rate, temperature, and impurity concentration in convection currents vary randomly about the mean values. The growth rate and composition of the crystal vary accordingly, and the body of the crystal contains the “imprints” of the consecutive positions of the crystallization front. A zonal crystal structure is formed. In metallic melts, magnetic fields are capable of halting convection and of eliminating the zonal structure. If the melt before the growth front is supercooled, then a protrusion formed by chance on the surface finds itself in a region of higher supercooling and its apical rate of growth increases even more. As a result, the planar growth front is broken up into rounded cupolas with the form of bands or hexagons in the plane of the front. This gives rise to a honeycomb structure (see Figure 6,a). 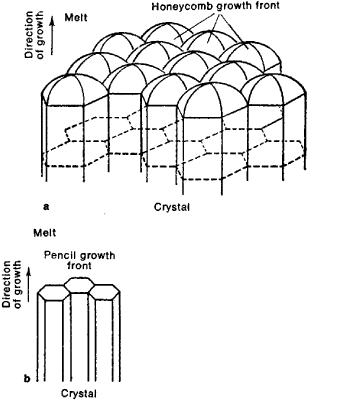 The boundaries between the cells (grooves) leave impurity-rich defect layers in the body of the crystal, so that the entire crystal consists, as it were, of hexagonal rods or plates (pencil structure; see Figure 6,b). If a supercooled melt or solution contains a small crystal rather than a flat surface, then protrusions on it develop in several crystallographic directions and generate a many-pointed star. These main outgrowths subsequently develop lateral branches, which develop branches of the next order, and so on, to give a dendritic crystal form. In spite of its peculiar form, the crystallographic orientation of the dendritic crystal is the same for all of its branches. The necessary conditions for the development of dendrites in layered crystals are extensive supercooling and poor mixing. At very low rates of growth from melts the distribution coefficient of the material ceases to depend on the direction and rate of growth and approaches the equilibrium value (determined by phase diagram). Formation of defects. Real crystals always exhibit nonuniform distribution of impurities (sectorial, zonal, or pencil structure). An impurity alters the lattice constant, and internal stresses develop at the boundaries between regions of different composition. These stresses lead to the generation of dislocations and cracks. In crystallization from melts, dislocations develop as the result of elastic stresses in a nonuniformly heated crystal and during the growth of warmer layers on colder surfaces. Dislocations may be “inherited,” transferred from the seed crystal to the growing crystal. Extraneous gases that are highly soluble in the mother medium but poorly incorporated into the growing crystal form bubbles at the growth front. These bubbles are acquired by the crystal when the growth rate exceeds a certain critical value. Extraneous solid particles are appropriated in the same way from the mother medium and become sources of internal stresses in the crystal. Mass crystallization, the simultaneous growth of a multitude of crystals, is widely used in industry. Very small seed crystals (∼ 0.1 mm) are used in the preparation of crystals of approximately uniform size and form. The process is then conducted in a temperature range within which new nuclei will not form spontaneously. Spontaneous mass generation and growth of nuclei occur during the solidification of metal castings. The crystals are generated primarily at the cooled walls of the mold into which the superheated metal has been poured. The nuclei at the wall are randomly oriented. Only those nuclei that exhibit maximum growth at right angles to the wall survive during the growth process. This results in the formation of an acicular zone at the surface consisting of almost parallel narrow crystals that extend at right angles to the surface. Convection currents in the melt are capable of breaking off dendritic branches, thereby supplying new seed crystals. Analogous results are obtained with ultrasound; by the addition of powders, the particles of which act as crystallization centers; and by surface-active materials, which facilitate the formation of nuclei. Shubnikov, A. V. Kak rastut kristally. Moscow-Leningrad, 1935. Shubnikov, A. V. Obrazovanie kristallov. Moscow-Leningrad, 1947. Lemlein, G. G. Sektorial’noe stroenie kristallov. Moscow-Leningrad, 1948. Kuznetsov, V. D. Kristally i kristallizatsiia. Moscow, 1953. Chernov, A. A. “Sloisto-spiral’nyi rost kristallov.” Uspekhi fizicheskikh nauk, 1961, vol. 73, issue 2, p. 277. Chernov, A. A. “Rost tsepei sopolimerov i smeshannykh kristallov—statistika prob i oshibok.” Uspekhi fizicheskikh nauk, 1970, vol. 100, issue 2, p. 277. Matusevich, L. N. Kristallizatsiia iz rastvorov v khimicheskoi promyshlennosti. Moscow, 1968. Palatnik, L. S., and I. I. Papirov. Epitaksial’nye plenki. Moscow, 1971. The formation of a solid from a solution, melt, vapor, or a different solid phase. Crystallization from solution is an important industrial operation because of the large number of materials marketed as crystalline particles. Fractional crystallization is one of the most widely used methods of separating and purifying chemicals. In fractional crystallization it is desired to separate several solutes present in the same solution. This is generally done by picking crystallization temperatures and solvents such that only one solute is supersaturated and crystallizes out. By changing conditions, other solutes may be crystallized subsequently. Repeated crystallizations are necessary to achieve desired purities when many inclusions are present or when the solid solubility of other solutes is significant. For a discussion of crystallization in glass, a supercooled melt. Polymer crystals obtained from solutions are used to study the properties of these crystals, while crystallization of polymer melts dramatically influences polymer properties. A few methods have been developed to estimate the effective energy barrier ([DELTA] E) in nonisothermal crystallization processes using differential thermal data (kinetic parameters) measured at different scanning rates. The degree of crystallinity was always slightly lower for the nanocomposite sample, indicating a disturbing effect of the clay particles on the crystallization processes. From the nonisothermal crystallization analysis, the crystallization peak temperature of nonisothermal crystallization processes of PEEK80, PEEK94, and PEEK129 can be compared in Fig. The nucleation behavior and the overall kinetics of crystallization, therefore, are analyzed to further explore the roles of the CNTs acted in various crystallization processes. In this work, attention is also focused on the isothermal crystallization processes of these composites from the melt in order to analyze the effect of the concentration of TLCP on the morphological changes particularly on the growth of PPS crystals. The combined Avrami-Ozawa equation was used to analyze the nonisothermal crystallization processes of the LDPE and LDPE/Al composites, the results showing that the combined Avrami-Ozawa equation can successfully describe the nonisothermal crystallization process. This is probably because of the secondary crystallization processes taking place during nonisothermal crystallization of PP in the presence of kenaf fibers, but also to the fact that at a given temperature, the crystallization process proceeding at different cooling rates, is at different stage: at higher cooling rates, the crystallization is at an early stage, while at lower cooling rates, the process is toward the end of crystallization stage. 1/2]) of the crystallization of PCL/AT nanocomposites are decreased obviously, as listed in Table 2, which means that the crystallization processes of PCL/AT nanocomposites are finished in shorter time than that of the pure PCL.